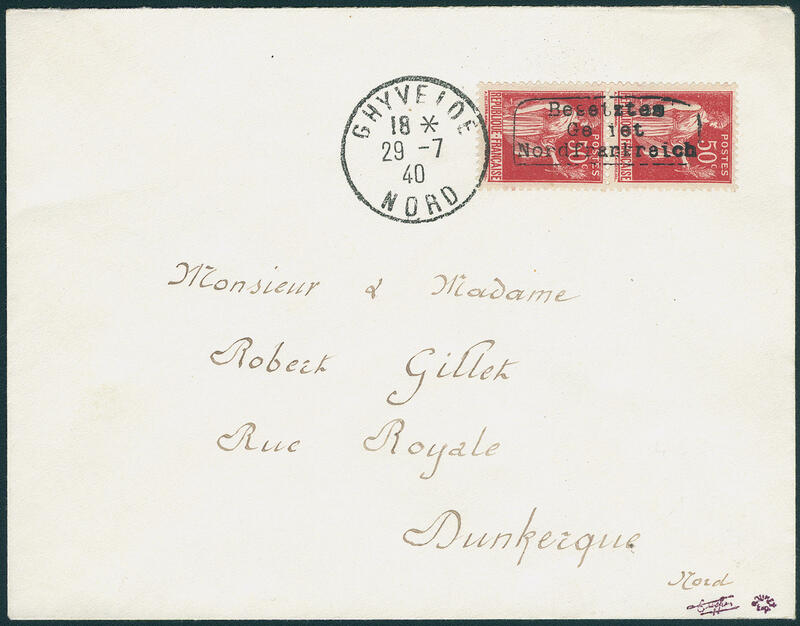 5614 ✉ 2I 50 C. Red, type I, in the horizontal pair, as correctly franked on cover from \"DUNKERQUE 6.7.40\" to Bourbourg with arrival postmark. Photo expertize \"the condition is perfect\" autumn VP. Michel 600,- €. 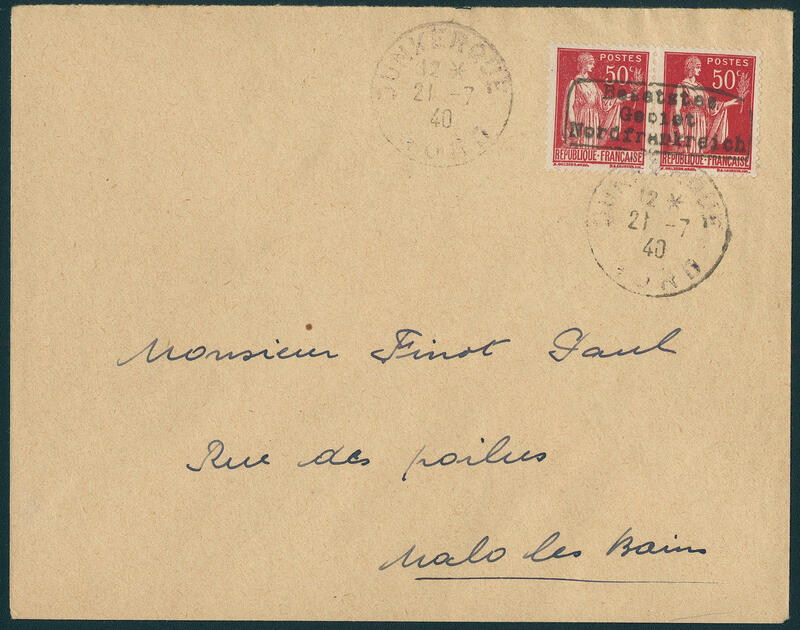 5615 ✉ 2I 50 C. Red, type I, in the horizontal pair, as correctly franked on cover from \"DUNKERQUE 21.7.40\" to Malo les Bains with arrival postmark. Photo expertize \"the condition is perfect\" autumn VP. Michel 600,- €. 5616 ✉ 2I 50 C. Red, type I, in the vertical pair as correctly franked on cover from \"GHYVELDE 29.7.40\" to Dunkirk with arrival postmark. Photo expertize \"the condition is perfect\" autumn VP. Michel 600,- €. 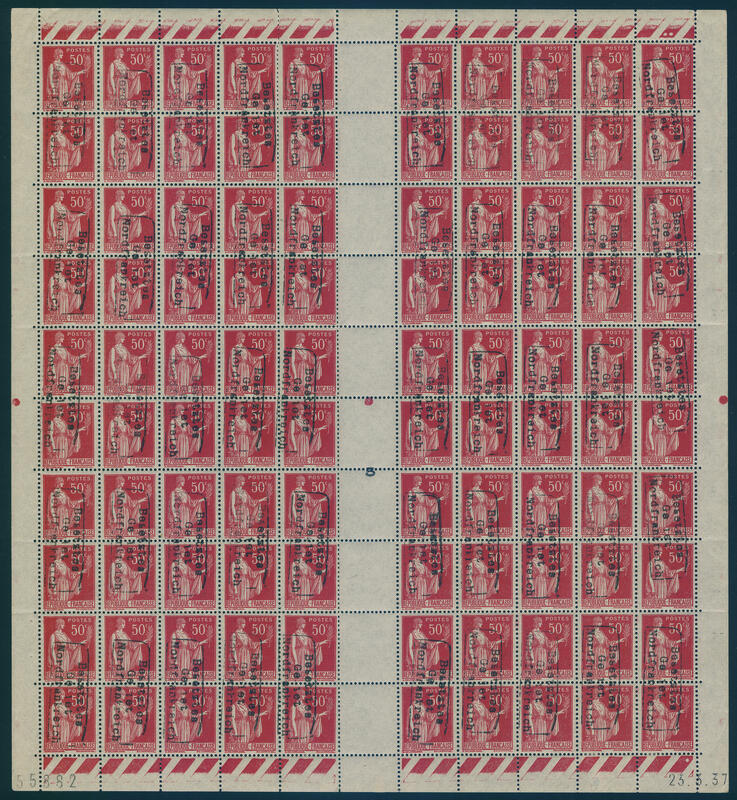 5617 2I/IIKs 50 C. Peace allegory, complete original sheet to 100 values with gutters, partly prefolded respectively slight separations, a few a few stamps in the margin region with affixed spots. A few stamps have slight tiny spot of the overprint color, otherwise is the quality in perfect condition mint never hinged all pairs with inverted vertical overprints top down. A spectacular, in this kind seeming unique unit for the large special collection! Photo expertize autumn VP. Michel approximate 30000,- €. 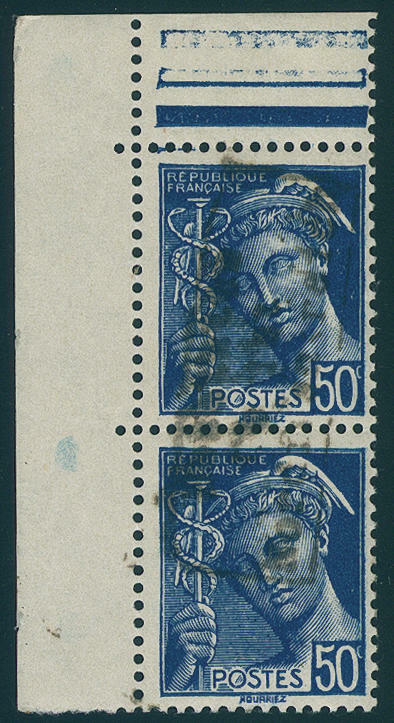 5618 2I/IILKdr 50 C. Peace allegory, type II, with overprint in type I, block of ten with two attached blank fields and date of printing, left vertical pair with inverted vertical overprint (so-called tête-bêche), all the others values with normal overprint, in perfect condition mint never hinged a spectacular unit! Photo expertize \"the condition is perfect\" autumn VP. 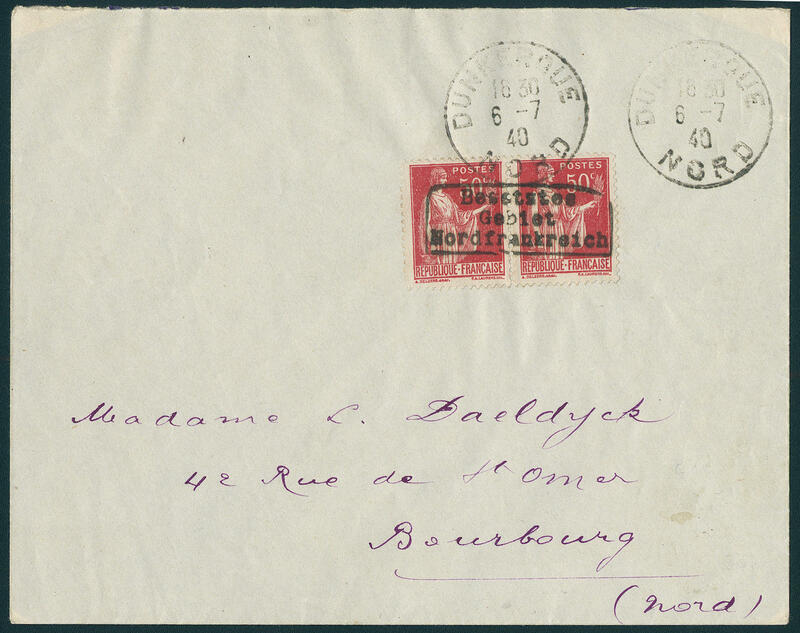 5619 ✉ 2IFDC 50 C. Red, type I, in the horizontal pair, as correctly franked on locate First Day Cover from \"DUNKERQUE 1.7.40\" with arrival postmark. Photo expertize \"the condition is perfect\" autumn VP. 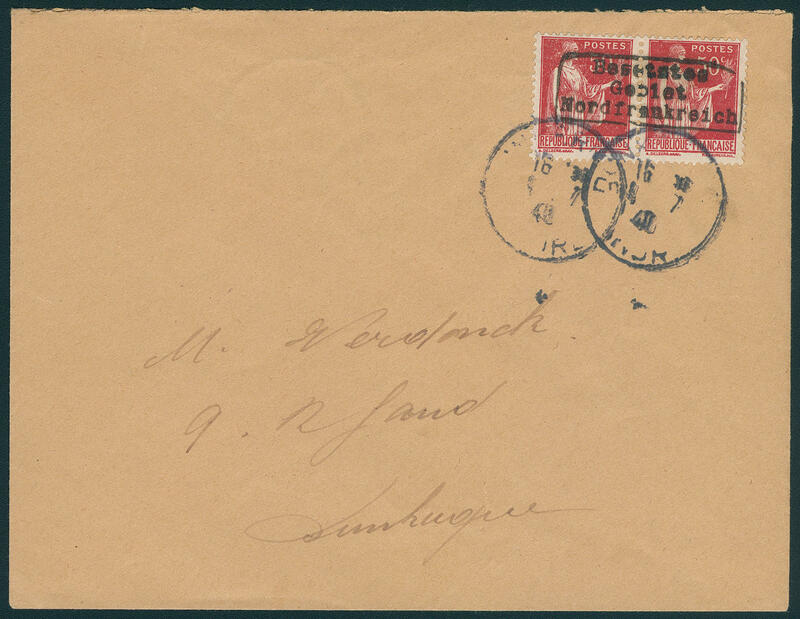 5620 ✉ 2IFDC 50 C. Red, type I, in the horizontal pair, as correctly franked on locate First Day Cover from \"DUNKERQUE 1.7.40\" with arrival postmark. 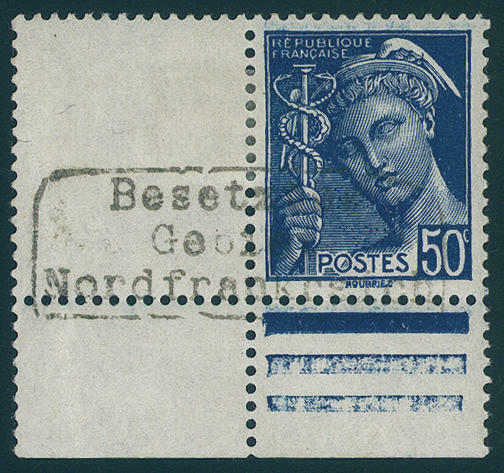 Right stamp perforation a little shaded. Photo expertize \"the other condition is perfect\" autumn VP. 5621 2IILKdr 50 C. Peace allegory, sensational unit of 30 values with six attached blank fields, twice horizontal in the perforation prefolded, in perfect condition mint never hinged all values with scarce overprint in of the type II, herewith three vertical pairs with vertical overprints, so that so-called \"tête-bêche\" are present. 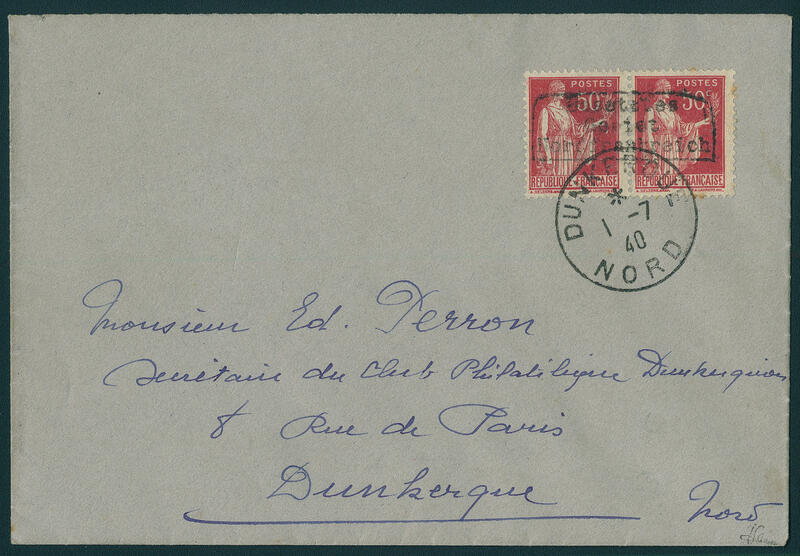 Reverse is, like nearly always, the genuine postmark from Coudekerque business mounted as authenticity mark. The edition amounted to be on only 500 pairs. The largest known unit and in this kind seeming unique! Photo expertize \"the condition is perfect\" autumn VP. Michel 33900,- €. 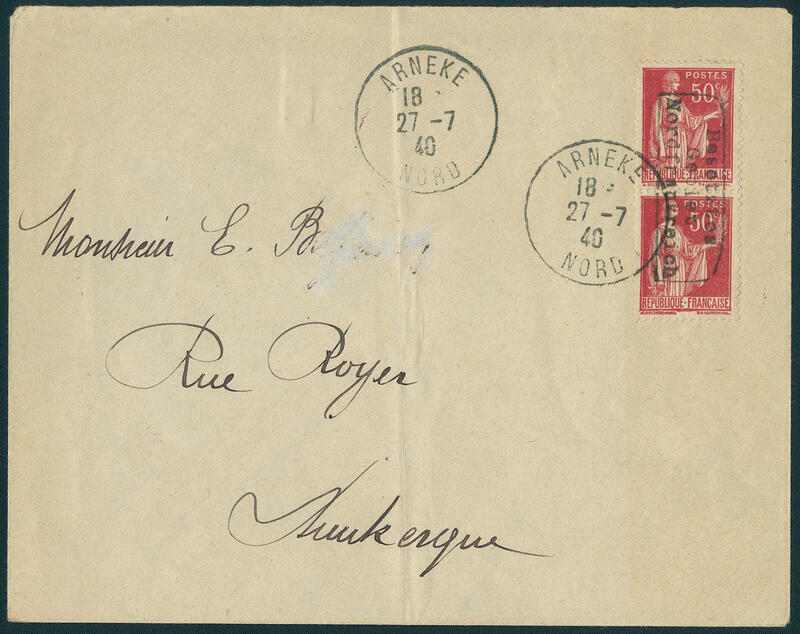 5622 ✉ 2IK 50 C. Red, type I, in the vertical pair, with inverted overprint, as correctly franked on folded cover from \"ARNEKE 27.7.40\" to Dunkirk with arrival postmark. Photo expertize \"the condition is perfect\" autumn VP. Michel 800,- €. 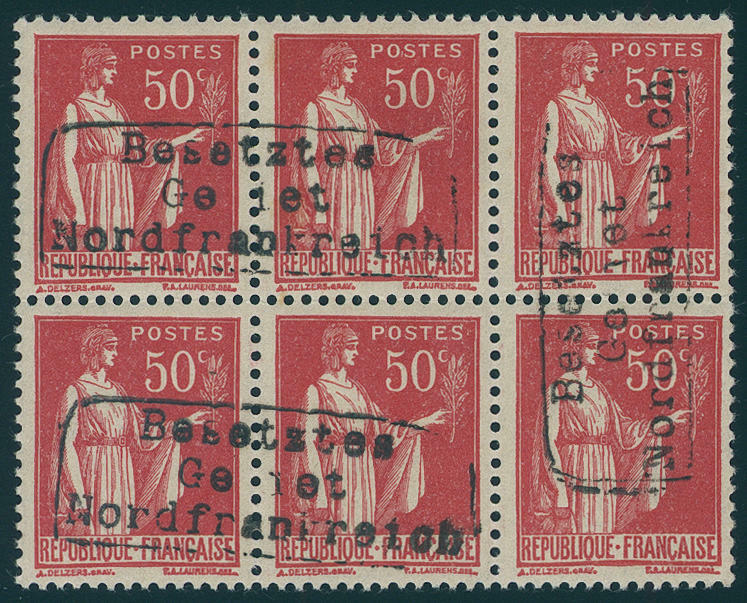 5623 2IKdr 50 C. Red, type I, two horizontal and a vertical pair as tête-bêche block of six, one stamp light tint as well perforation right bluntish, otherwise in perfect condition mint never hinged rare. Photo expertize \"the other condition is perfect\" autumn VP. Michel 1800,- €. 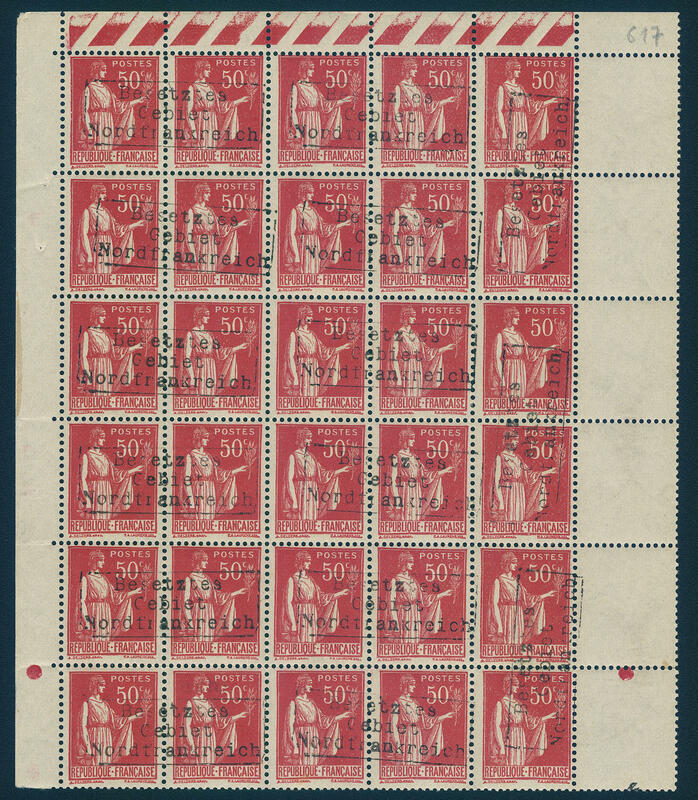 5624 2IKdr 50 C. Red, type I, two vertical and four horizontal pairs as tête-bêche block of twelve from the left lower corner of the sheet with sheet number. Stamps regumed as well perforation a little separated, rare. Photo expertize autumn VP. 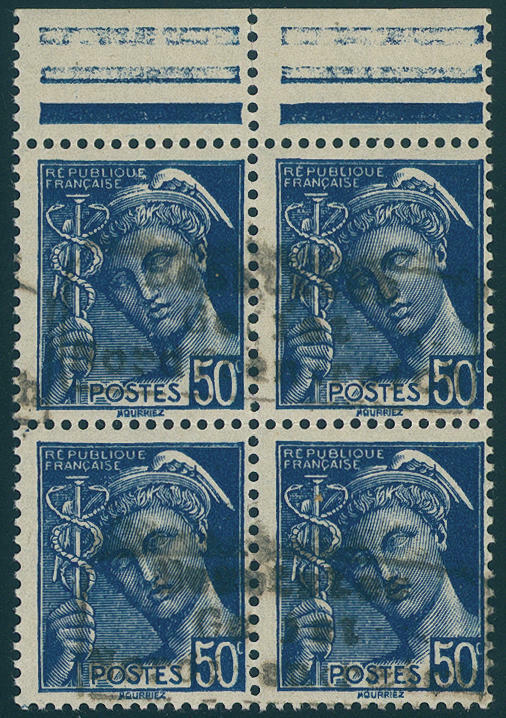 5625 3I 50 C. Blue, type I, two horizontal pairs block of four from upper margin, in perfect condition mint never hinged edition 3000 pairs. Photo expertize \"the condition is perfect\" autumn VP. Michel 600,-.? 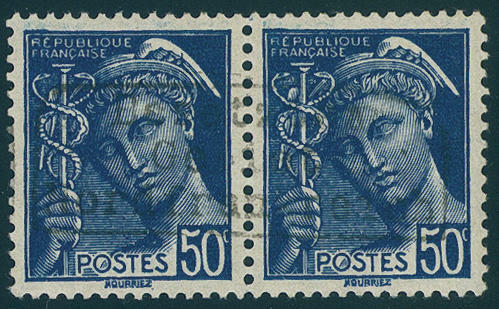 5626 3I 50 C. Blue, type I, vertical pair from the left upper corner (hinge trace in the upper margin), in perfect condition mint never hinged edition 3000 pairs. Photo expertize \"the condition is perfect\" autumn VP. Michel 300,- €. 5627 3I 50 C. Blue, type I, in the horizontal pair, in perfect condition unused photo expertize \"the condition is perfect\" autumn VP. Michel 160,- €. 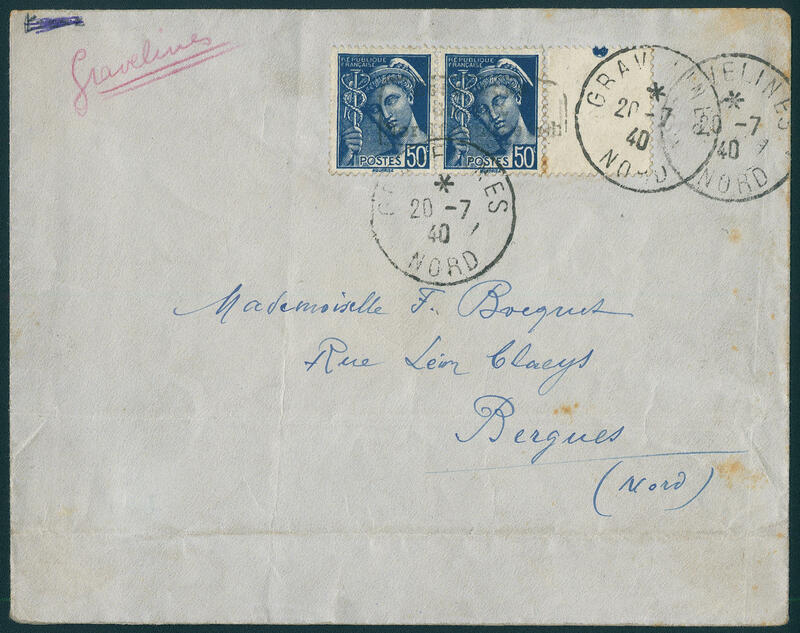 5628 ✉ 3I 50 C. Blue, type I, in the horizontal pair with glued-on blank field right, as correctly franked on cover from \"GRAVELINES 20.7.40\" to Bergues with arrival postmark. Strength use- and transport traces. Photo expertize autumn VP. 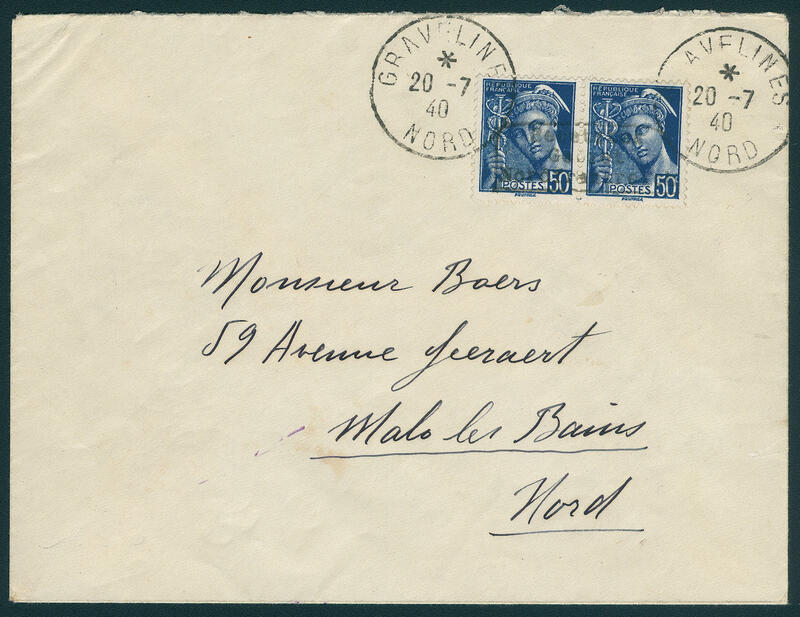 5629 ✉ 3I 50 C. Blue, type I, in the horizontal pair, as correctly franked on cover from \"GRAVELINES 20.7.40\" to Malo les Bains with arrival postmark. A rare stamp. Photo expertize \"the condition is perfect\" autumn VP. Michel 600,- €. 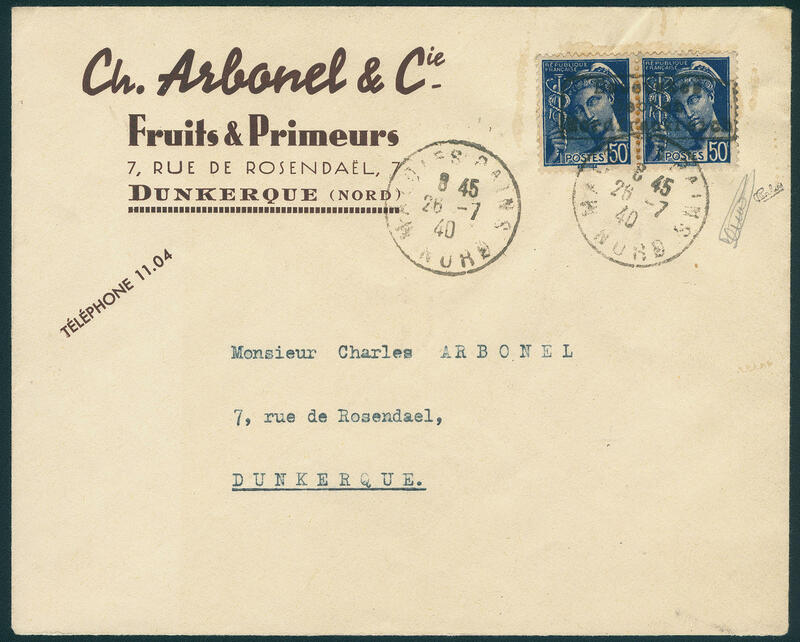 5630 ✉ 3I 50 C. Blue, type I, in the horizontal pair, as correctly franked on cover (traces of usage) from \"MALO LES BAINS 26.7.40\" to Dunkirk with arrival postmark. Slight gum spots. Photo expertize \"the condition of the stamps is perfect\" autumn VP. Michel 600,- €. 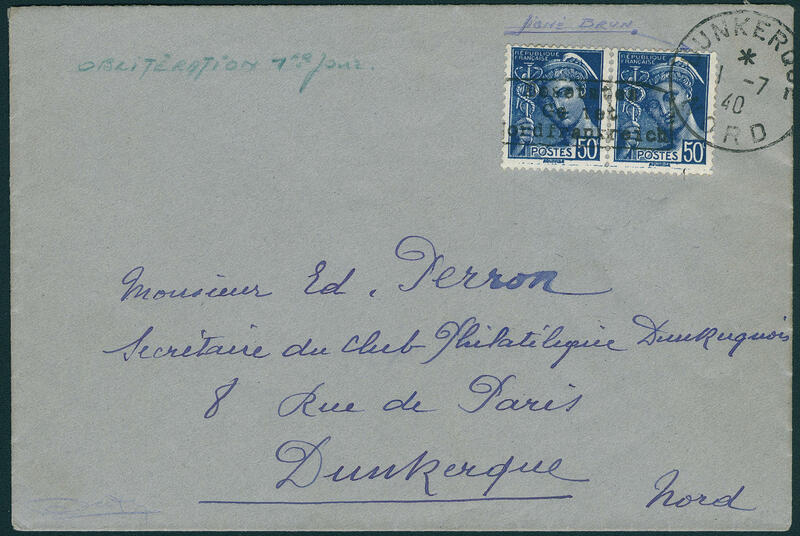 5631 FDC 3I 50 C. Blue, horizontal pair with overprint \"Occupied area North France\" in type I, in perfect condition on First Day Cover with single circle postmark \"DUNKERQUE 1.7.40. \". Very rare! 5632 / 3IKdr 50 C. Merkur, block of ten with two attached blank fields left and date of printing, left pair and the two of them right pairs with vertical overprints (so-called tête-bêche), two pairs with horizontal overprints, mint never hinged / unused, various faults, a very scarce unit, photo expertize autumn VP. 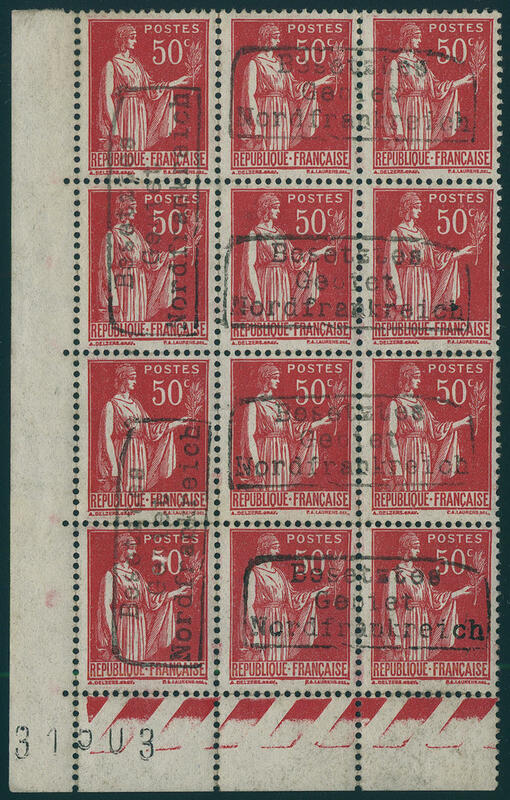 5633 3IL 50 C. Merkur from lower margin with left attached blank field and joint overprint in type I, blank field and lower margin with weak vertical trace of crease, otherwise in perfect condition unused. Very rare! Photo expertize autumn VP.